WHAT IS COST STRATEGY ? 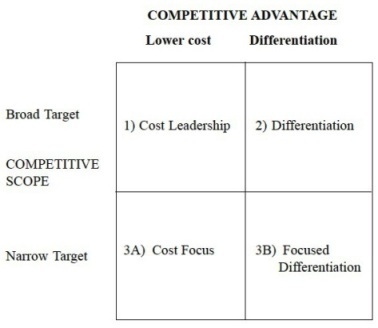 HOW TO GAIN COMPETITIVE ADVANTAGE THROUGH COST STRATEGY ? All the three strategies can either be used individually or in combination to each other. 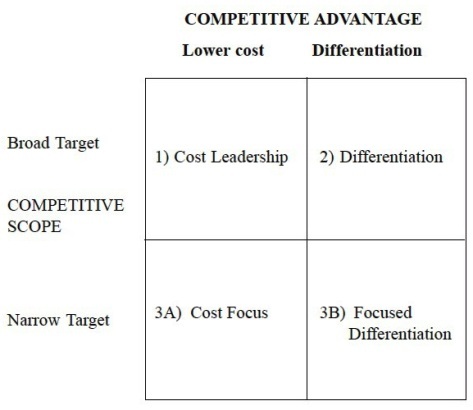 Figure-1 shows a matrix of the three generic competitive strategies and their interrelationship given by Porter. You have noted that costs play an important role in the survival and growth of a business firm. For survival, a business firm must make some profit so that it can sustain its operations on a long-term basis and fulfil its other obligations. Before a business starts operating, it has to incur certain initial costs for acquiring assets, such as land, building, plant and equipment. These assets have to be installed and commissioned. Then the raw materials are paid for and fed into the machines so that the finished goods can be produced. These are then sold in the market to generate revenue. A part of this revenue is used for repaying instalments towards loans and other borrowings. The shareholders also expect certain returns in the form of dividends on the equity held by them. Hopefully, after meeting such expenses, the firm is left with some revenue to buy the raw materials and other needed utilities so that it can run the next operating cycle of the business process. The survival and growth of the business firm, to a large extent, depends on what the firm pays for its fixed costs and what contribution it generates after meeting all the expenses. Apportioning of the fixed costs incurred by the firm in starting a business depends on the volume of its operations. A lower volume of products puts a heavy burden on each unit produced. A larger volume of operations reduces the cost per unit. The total variable cost, which varies with the volume produced, may also reduce, as a consequence of the ExperienceCurve Effect. Cost is an important aspect of running any business operation. It is a major level for running the business activities, and has its influence on the progress of an organization. Acceleration, stagnation or deceleration in progress are affected by it. While the markets are operating as sellers’ markets, the cost may not be considered so critical in determining the profits of a running organization. Under sellers’ market conditions, price is fixed on cost plus basis. So whatever is the internal cost, the desired profit margin is added to it by the business firm, and the price is derived accordingly. Thus, Price of a Product = Internal Cost + Desired Profit Margin. Here, the price of the product is the derived variable, and the cost is an independent variable. The customer in the market is forced to pay the price so derived by the sellers. If the cost moves up, due to certain unavoidable factors like scarcity of raw material, labour problems or additional taxation, the manufacturer/seller merely takes the boosted cost figures, adds his/her desirable profit margin and sells the goods at the enhanced price. In the sellers’ market conditions (say due to shortage in emergency conditions or man-made), the customer has no choice but to buy goods at the new prices. Under these conditions, the seller is not much worried about the costs or their upward movements, as he can pass on these additional burdens to the customers. Under the new conditions, the price of a product is decided outside the organization in the market place and, not according to the wishes of the manufacturer or supplier. The price becomes an independent variable decided by the competition in the market place. Each competitor, in general, may choose a different level of acceptable profit for himself or fix the price matching with the market requirements. As the competitors become more and more active there will be a downward push on these permissible profits, unless the firm activates itself for effective cost reduction. Thus, unlike in the sellers’ market conditions, now the cost or profit margin becomes the derived variable. If the firm can’t do much about the cost of manufacture or supply, then the profit margin also gets fixed by the market forces, and the firm has to decide whether it can survive at the prescribed level. The other alternative for the organization is to fix a minimum acceptable profit (or contribution), and then determine its tolerable level of cost. The next step is to do a careful introspection and see what are the different variables getting into the cost of goods, and find ways and means to reduce the cost so as to improve its profitability. One way of doing this is to make use of the Experience Curve, and the other way is to carefully consider its break-even point and operate well above this level. You have noted that costs play an important role in the survival and growth of a business firm. For survival, a business firm must make some profit so that it can sustain its operations on a long-term basis and fulfil its other obligations. Before a business starts operating, it has to incur certain initial costs for acquiring assets, such as land, building, plant and equipment. These assets have to be installed and commissioned. Then the raw materials are paid for and fed into the machines so that the finished goods can be produced. These are then sold in the market to generate revenue. A part of this revenue is used for repaying instalments towards loans and other borrowings. The shareholders also expect certain returns in the form of dividends on the equity held by them. Hopefully, after meeting such expenses, the firm is left with some revenue to buy the raw materials and other needed utilities so that it can run the next operating cycle of the business process. The survival and growth of the business firm, to a large extent, depends on what the firm pays for its fixed costs and what contribution it generates after meeting all the expenses. Apportioning of the fixed costs incurred by the firm in starting a business depends on the volume of its operations. A lower volume of products puts a heavy burden on each unit produced. A larger volume of operations reduces the cost per unit. The total variable cost, which varies with the volume produced, may also reduce, as a consequence of the Experience Curve Effect. kееp it up all the tіme.